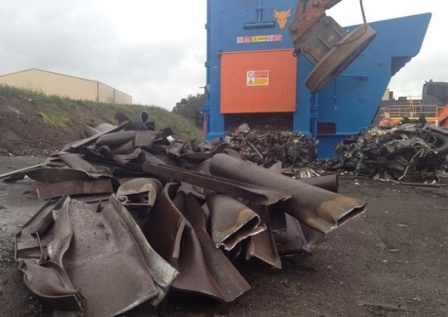 OneSteel Recycling ferrouse scrap metal has increased profitability by hundreds of thousands of dollars per year by downsizing scrap metal quickly with their Taurus stationary shear baler. OneSteel Recycling challenged A-Ward to supply a shear baler to downsize scrap metal into ‘in-size’ lengths for local and export customers. OneSteel wanted a high-performing, cost-effective shear baler that would provide a very fast return-on-investment. The conventional method used by OneSteel to produce ‘in-size’ product was to gas cut individual steel pieces manually. This proved to be extremely slow, expensive and caused a multitude of health & safety risks. With no shredder in close proximity to this OneSteel yard, the shear baler also had to provide a solution for baling light gauge product to maximize densities for transport. A-Ward Supplied and installed a Taurus C872 800 ton shear baler at one of OneSteel’s Australian Yards. This shear is fixed on a solid supporting framework and is one of the heaviest quality-built shears available in its price range. With patented Taurus “folding wings” material can be compacted for shearing at a faster rate. OneSteel’s C872 has a 7.2m (283”) box length, includes an operator cabin and platform and a remote control for one man operation. The diesel engine option was also selected and full data logging is available through a touch screen in the cabin. OneSteel Recycling has increased profitability by hundreds of thousands of dollars per year by downsizing product quickly and maximizing productivity. OneSteel’s Taurus C872 has exceeded their expectations, running 8 hours a day with a single operator. OneSteel can easily change from shearing to baling in seconds with the flick of a switch, resulting in almost no down time. Health and Safety issues have also been eliminated.